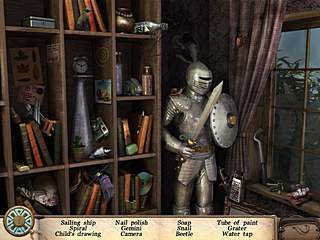 Behind the Reflection is a standard hidden object game, that was made by Alawar Entertainment. The story starts pretty intriguingly. One day a mother and her son enjoy walking the streets. Being tired they decide to stop for a while and have a break. Mom talks on her cell phone and a boy wanders away to look around. After approaching to the mirror he suddenly gets absorbed by it. The mother is in despair, but she starts her travel, full of danger, adventure and mystery, in order to find and rescue her son. The game has a captivating storyline and multiple minigames, which you will enjoy a lot! There is nothing new as for the tasks. They are easy and thus you won't need much time for solving them. In the HOG scenes as alwas you will need to look for the items, hidden all over a location, and collect them. Every scene has some special articles which you may use in further parts of the game. You will also have to find and collect parts of the map, by solving different mini puzzles, that are everywhere you turn. As for me, they are quite simple but fun. And be ready – puzzles will pop up, where you least expect them: both when you gather all the parts needed to complete an object and when you just click on an item. But there are only 30 seconds wait to skip, so you can always see solved puzzles, if you don't want to waist your time on them. As usually you will have to move from location to location and complete some tasks. But here you get one more feature: sure that sometimes you will have to come to the same location back for several times. But the tasks are so involving and the graphics is so good, that you won't even notice that you have already been to that place before. Maybe this feeling was caused in me because of the variety of tasks. But maybe because of the cute graphics... It's so skillfully made, that sometimes you can't realize it is reality or just fantastic world! Amazing parks, nice streets, realistic buildings and many other captivating things. There are also a lot of minigames, which I enjoyed a lot. Especially those, where I had to build a bird feeder and feed birds. It was so lovely! I hope you could enjoy them too. The music of the game is nice and it fits the storyline perfectly, but I wish I could hear characters' voices during the dialog scenes, which help you be imbued with highly captivating game atmosphere! In summary, I would say that it's a nice game, so you won't regret that you spent your time on it, especially if you like adventure, mystery and puzzles. So, hurry up and help the mother tofo find and rescue her son, who disappeared in the parallel world inside a mirror! 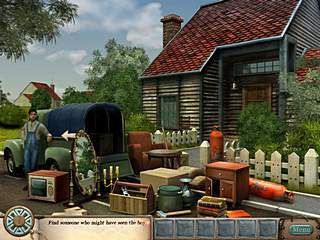 Start your trip, full of danger, adventure and mystery, but reflecting an all-conquering mother's love in Behind the Reflection, a fun and exciting Hidden Object game! This is Behind the Reflection review. Download this game here.